The model for Penny Autumn was stitched on 36 ct. Wren by Picture This Plus, and it's worked in all cross stitch over two threads and a little back stitching on the birds' beaks and feet. The stitch count is 115w x 91h. The threads are by Classic Colorworks (with a DMC conversion on the chart) in German Chocolate, Brandied Pears, Black Coffee, Just Rust, Hazelnut, Caramel, Antique Lace, Hickory Sticks, Pebble Beach, and Honeycomb. One of my dearest friends, Pat Ryan, stitched this model, and did a beautiful job on it, as usual! 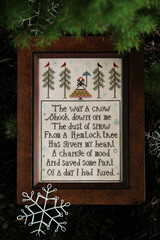 The linen used was 36 ct. Sea Fog by R&R Reproductions, and it twas worked in all cross stitch over two threads. The stitch count is 145w x 108h. Threads used are by Classic Colorworks and Weeks Dye Works. Here are the CC's: Cinnamon Toast, Wilderness, Avocado, Sunset. And here are the WDW colors: Pelican Gray, Confederate Gray, Parchment, Chesapeake, Schneckley, Cayenne, and Charcoal. A conversion to DMC is also provided in the chart. As for the date on the design? That was the year Hans Christian Andersen had The Little Mermaid published! 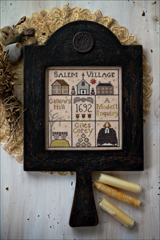 The linen used for the White Pumpkin Farm model was 36 ct. Olde Towne Blend by R&R Reproductions, using one strand of floss over two linen threads. The stitch count is 130w x 118h. From Classic Colorworks: Pebble Beach, Toasted Marshmallow, Blackbird, and Onion Skin. From Weeks Dye Works: Red Rocks, Grits, Kudzu, and Charcoal. Thank you, Sherri, for the beautiful star frame! This model was stitched by Deborah Bixby (beautifully, I might add! ), on 36 ct. Vintage Pearled Barley by Lakeside Linens. The stitch count is 118w x 130h. The threads used for Earthly Treasures are from Weeks Dye Works in Kris' Bon Bon, Terra Cotta, Onyx, Pamlico, Pebble, Juniper, and Kudzu. A DMC conversion is provided in the chart. 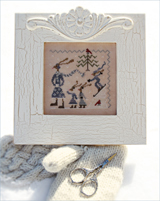 The stitches used are cross stitch over two threads, and a small amount of cross or tent stitch over one thread (just the angel's facial features; there is no filling in work to do). The chenille trim for the cushion is in the color Mossy, by Lady Dot Creates. Thank you, Lois, for always being so wonderfully patient with me! That's it! I hope you like what I've put together for you for the show.. if you see anything you like, just ask your shop owner to order for you! I'm so thankful you stopped by... I'll see you soon! It's been a very busy and enjoyable summer here at Plum Street, and if you haven't seen them by now, I'll show you my three releases from earlier in the month. As you may know, last year I released the very first "BYOF" (Bring Your Own Fabric) kit, also known as the Serial Bowl Collection, called Sampler Lesson One. I've decided to release it as a chart only, for those who missed out on the kit! Classic Colorworks floss in Barn Door, Cherry Cobbler, Cinnamon Toast (one of my favorite CC colors! ), Pea Pod, Sunkissed, and Timber. Trim used is cream chenille that has been coffee-dyed. The threads that went into the kits were so beautiful, I just had to post their photo again! My second July release introduces Miss Babushka, tending to her pumpkin blossoms. I originally had a Mr. Babushka designed in the piece, but as I stated on Facebook earlier, he was a doppelganger for Willie Nelson, so I removed him and gave him his own blank canvas, possibly to be revisited some day. Classic Colorworks floss in Rose Petal (very few stitches in this color), Brown Sugar, Ye Olde Gold, Bean Sprout, Just Rust, Hickory Sticks, and Colonial Copper. Gentle Art in Gold Leaf, Oatmeal, Heirloom Gold, Lambswool (very few stitches), Espresso Bean, and Wood Trail. Linen used: 36 ct. Vintage Examplar by Lakeside Linens. 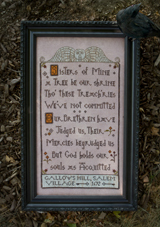 Framed by Sherri Berkman of Total Framing in Fairfax, Virginia. Thank you, Jean Hohulin, for stitching the model, and restitching my error! Lastly, I have a brand new Serial Bowl Collection to introduce! It's an autumn-and-Halloween-themed one, and I hope you like the first design in the series! 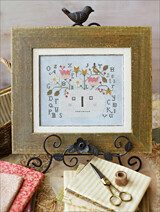 The kit contains threads and chenille to complete the project once on 28, 32, 36, or 40 ct. linen or Aida. 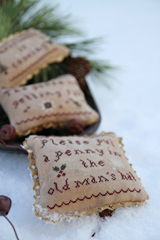 Threads included in the kit are by Weeks Dye Works, and the chenille is by Lady Dot Creates, in the color Vintage. The model was stitched in Pat Ryan's usual light-speed style. Thank you, Pat! These kits are only shipped to shops that request them, so if you're interested in purchasing one, let your local or online shop know! Thank you so much for stopping by my oft-neglected blog. Every time I vow to do better, my time gets absorbed by other things, and I really miss blogging! Here is a picture of Sophie and I from the Fourth of July.. I miss her so much! She's in Texas right now, visiting her sister Sabrina, and she comes home tomorrow. I can't wait! Enjoy your day, and I'll see you soon!